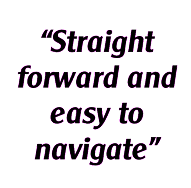 This post follows on from my earlier post Form E: different ways to complete it, plus the cover page and Section 1, and takes you step by step through completing the first four parts of section 2 of Form E.
1. Documents needed – you should have started collecting these! If not, see my earlier post here on how to do this. 3. Land registry title number – It is unlikely you will know this, though it will be on your property’s title deeds if you can find them. If you can’t find the number, just leave this box blank. 4. Mortgage company information – you will find this on your most recent mortgage statement. If you have more than one mortgage on the family home, list them all. 5. Type of mortgage – examples are ‘repayment’, ‘interest only’, ‘offset’. If you don’t know, check your latest mortgage statement. 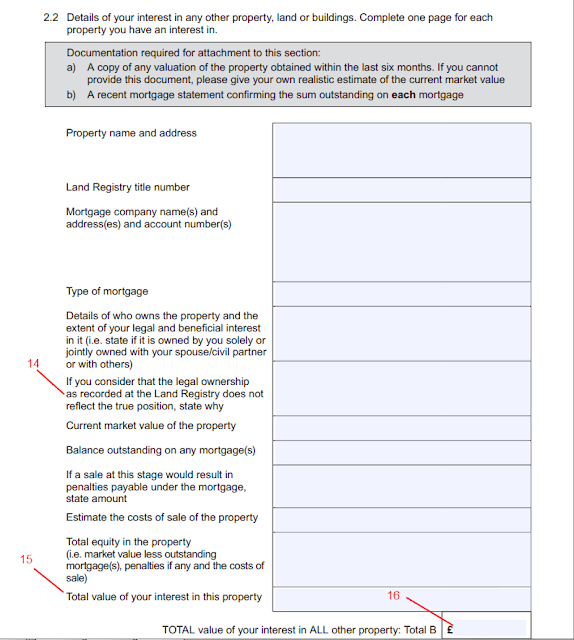 If you’ve listed more than one mortgage in the box above, state the type of mortgage for each of them. 6. Ownership of the property – what they are after here is ‘solely owned’ or ‘jointly owned’ for example. If it’s jointly owned put ‘50%’ as well (or the relevant percentage if different). 7. Legal ownership – this bit can be difficult. The question refers to whether you have a beneficial interest in a property owned solely by your ex-partner. That means that although your name is not listed on the title deeds, you believe that the ownership ‘on paper’ doesn’t reflect the true position. If your interest is not beneficial (i.e. you are named on the title deeds) then leave this blank. If you believe you do have a beneficial interest then given this section relates to the family home, and if it is owned solely by your spouse, I would say here that you have a 50% interest in the property. 8. Current market value – take this from the market valuations you should have obtained (see my earlier post on the documents needed to accompany Form E here). If you got more than one market valuation then take an average of them. 9. Balance outstanding on any mortgage – this will be on your most recent mortgage statement. If you have more than one mortgage, list the balance outstanding on each, and then put the total amount outstanding underneath them (in the same box). 10. Penalties payable under the mortgage – the obvious examples here are early repayment penalties or fees for paying off your mortgage. 11. Costs of sale – this refers to both estate agents and solicitors’ fees. Family lawyers use a standard of 2.5% of the value of the property – so I suggest you put 2.5% of the value you entered in 8. above. 12. Total equity in the property – this is what is left after the mortgage, any penalties and the costs of sale have been deducted from the value of the house. So calculate it by subtracting the figures in 9., 10. and 11. From the figure in 8. 13. Your interest in the family home – this is your share of the total equity. So if you own the house jointly with your ex-partner, it’s half of the figure you’ve entered in 12. above. 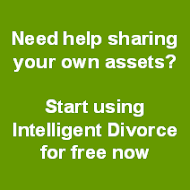 Complete this section if you own (jointly with your ex-partner or on your own) any property or land other than the family home. (Otherwise leave it blank.) 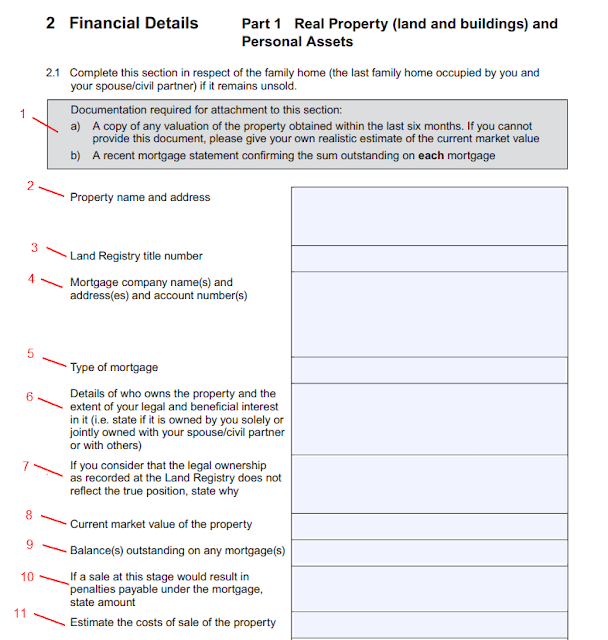 If you have more than one other property, you should fill in a copy of this page for each property, and number the additional ones as ‘5.1’, ‘5.2’ etc. Most of these questions, and the answers required, are exactly the same as for the family home above, so please refer to that. 14. Legal ownership – as in the family home, this is difficult. What is being asked is do you have a beneficial interest in a property legally owned by someone else. This will most often occur when your name is not on the deeds but you have contributed financially to the purchase of the property and it is acknowledged that by doing so you have acquired an interest in the property. 16. If you only have one other property then this is the same as 15. above. If you have more than one other property, and so have filled in more than one sheet here, then on this first sheet put the total of your interests in other properties (i.e. the sum of the figures in box 15.) in here. Complete this section if you have any bank, building society or National Savings accounts, held either in your sole name or jointly. Enter each account on a different row. 17. See my post on accompanying documents here for information on how to annotate these statements. 19. Balance at the date of this statement – this in fact means at the date your Form E is signed, but what is commonly accepted is to put the balance shown on the most recent statement you are attaching, which should of course be the most recent one (see 17. above). 20. 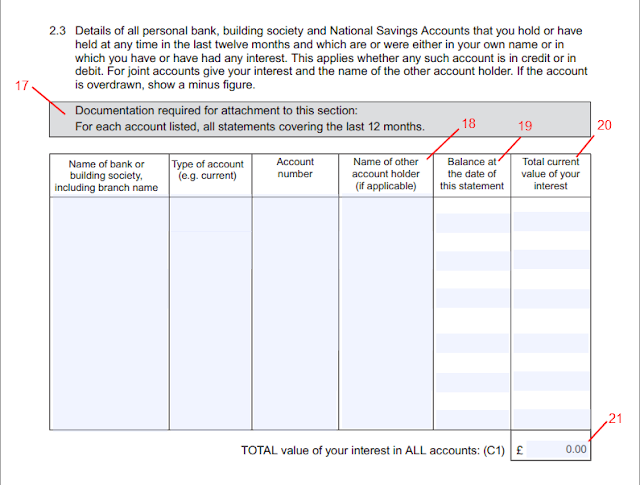 Total current value of your interest – if the account is a joint account remember to divide the figure given in 19. by two. 21. 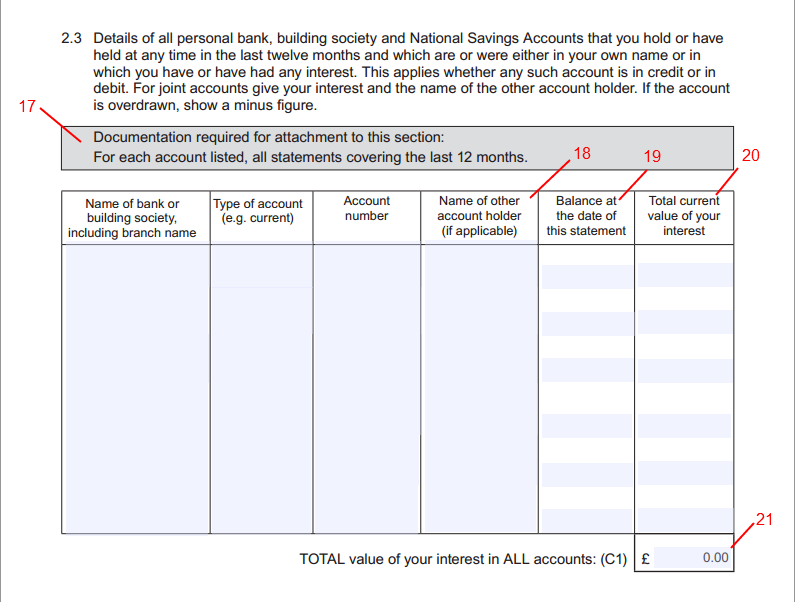 Total value of your interest in all accounts – the total of all the figures in box 20. 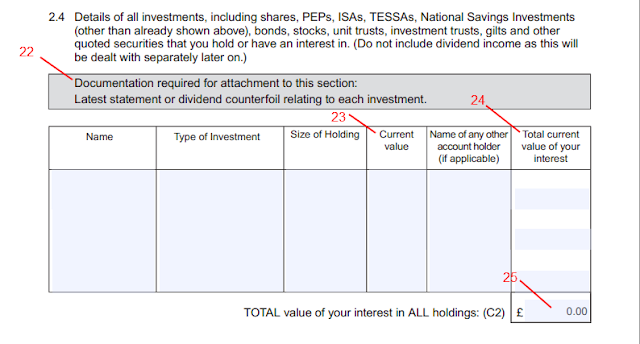 Complete this section if you have an interest in any of the investments listed in the heading, either in your sole name or jointly. Enter each investment on a different row. This is a ‘one size fits all’ section that does not entirely work as you are expected to put in it different sorts of investments. Therefore every box may need to be filled in – e.g. ‘size of holding’ is relevant if you are entering shares, but not if you have an ISA. 22. See my post on accompanying documents here. 24. Total current value of your interest – your share of the current value in 23., i.e. half of it if the investment is held jointly with your ex-partner. 25. 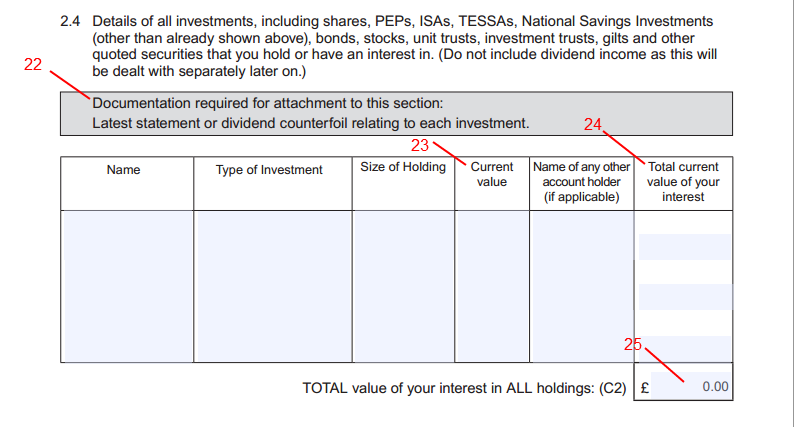 Total value of your interest in all holdings – the total of all the figures in box 24. I hope you've found this useful. My next post takes you through Section2 parts 5-8 (life insurance policies, money owed to you, cash sums and personal belongings).